Park Beach Surf Apartment - Coffs Harbour, New South Wales Guests overall rating: ★★★★★ 5 based on 4 reviews. Come to Australia’s spectacular east-coast where the surf and climate is great all year round. 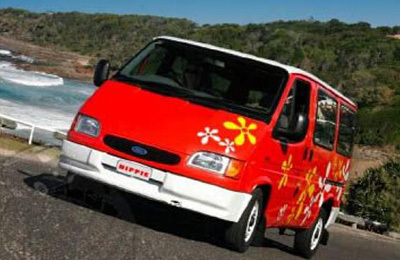 The Luxury Surf, Sights & Stay Holiday Packages fit all levels of surfer and non-surfers with sight-seeing trips, eco-tours and many additional activities included around the amazing Coffs Harbour region. Just you and your friends with your own personal tour guide! Expect plenty of left and right-hand point breaks, fun sandy-bottom open beach breaks and one-on-one time with your Surfing Australia accredited Surf Coach. After an excellent day surfing, pop your feet up at your spacious beachside apartment, relax and take in the view. Gourmet breakfast, kayaking, stand-up paddle boarding, Zorb soccer, sight-seeing trips, coastal walks and eco-tours in World Heritage Rainforests are included in your package. A variety of relaxation, tourist and adventure activities can be arranged as add-ons. 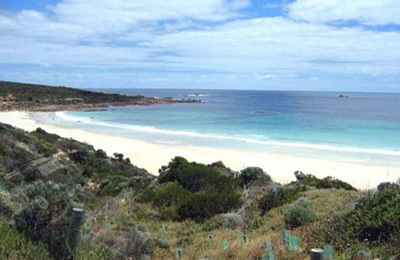 This is a value-packed, stress-free Aussie coastal experience and a holiday you’ll never forget! We offer a range of tour packages to suit your group and your budget. Groups are small and personalised, with a minimum of 2 and maximum of 6 people per tour. The tour is just for you and your friends… there will be no-one else on your tour! Accommodation in quality holiday apartments on Ocean Parade, adjacent to Coffs Harbour’s beautiful Park Beach and just a short walk from the Jetty Strip, renowned for it’s restaurants, cafes and scenery. You will have a two or three bedroom apartment, depending upon your package. The apartments are located in a residence with a swimming pool. Simply select the package with the type of accommodation that offers the level of space and privacy required by your group. Please see Activities section to choose a package. Coffs Coast beaches offer a range of left and right-hand point breaks, and plenty of fun, sandy-bottom open beach breaks. Your tour guide will take you to the breaks that suit your surfing ability. If you don’t want to bring your surfboard, you can arrange to hire one locally. Beginner boards are provided. Daily surf-lessons are included if required, with beginner boards, wetsuits and rashies provided. Advanced surfers will love the huge range of beaches and breaks that your tour guide will show you as only a local surfer can. Coffs Coast beaches are clean and uncrowded, and home to surfing legends including Harley Ingleby and Lee Winkler. Come ride the waves that made them famous! You simply choose the Deal that suits your budget and accommodation needs. Designed for couples or two friends who want the ultimate private and personalised surf, sights and stay holiday package. Accommodation is a two bedroom apartment, which will suit either a couple or two singles. It will be just the two of you, with your own personal tour guide. A great first or second Honeymoon! Designed for a group of three friends, who want a personalised surf, sights and stay holiday package with plenty of privacy. Your three bedroom apartment will suit three singles, or a couple and a friend travelling together. The tour will be just the three of you, with your own personal tour guide. Designed for a group of four friends who are happy to share a three bedroom apartment, with a variety of bedding arrangements available. Chill out together after your day of surfing and sight-seeing with this value-packed deal. Designed for two adults and up to two kids (under 18yrs). Kids are half-price, and the family group shares a three bedroom apartment, with a variety of bedding arrangements available. A great value, no-stress, family getaway package, tailored to your needs. The itinerary below is just a taste of what is offered. There are many and varied activities included in your package, and also a huge range of add-on adventure, tourist, and relaxation activities that your Guide can arrange for you. We will tailor-design a tour with you… all you have to do is relax and have fun. Come and experience a holiday to remember! 0600-0800 Sunrise surf at the best spot in Coffs Harbour (locals simply call it “Coffs”!). 8000-0930 Breakfast at a select local café in Coffs. 0930-1015 Up to Sealy Lookout where you can view the whole Coffs Coast, and get to know the coastline and surf spots. 1015-1200 Visit The Big Banana – Coffs’ favourite tourist attraction! Cool off and have fun at the same time, on the awesome waterslide. 1200-1330 Lunch at The Jetty — Coffs’ café and restaurant hub. 1330-1500 Walk along The Jetty, Breakwall and Muttonbird Island, taking in the specatular 360 degree views of ocean, harbour and mountains. 1500 Time to relax back at your apartment. Your Guide will show you the best places to dine nearby. 0600-0800 Sunrise surf at the best spot in Sawtell. 8000-0930 Breakfast at a select local café. 0930-0945 Check the surf from Bonville Headland lookout, keep your eye out for the local pod of dolphins that swim in this area. 0945-1200 Surfing at the best spot – or a surf lesson for beginners. Have a game of beach sports eg volleyball, cricket and football, with your friends. 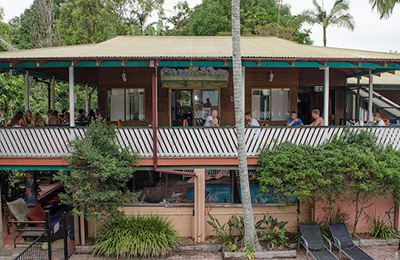 1200-1230 Lunch at Sawtell – choose from a huge range of cafes and restaurants in the famous, tree-lined First Avenue strip. 1230-1330 Check out the local specialty shops in Sawtell, or enjoy a massage or manicure at a local Day Spa. Take a stroll along a section of the Solitary Islands Coastal Walk and absorb the immense beauty of this remarkable coastal environment. 1330-1500 Enjoy Kayaking and Stand-up Paddleboarding around the pristine Bonville and Boambee Waters. 1500 Back to your apartment to post all your photos on Facebook! 0800-0930 Breakfast at a local Coffs café. 0930-1000 Drive through the scenic Bellinger Valley farmlands to the groovy town of Bellingen, where many people enjoy an alternative lifestyle. 1000-1200 Kayak along the Bellinger River, taking in the lush green river-side surroundings. 1200-1230 Lunch at one of the many cafes in this great little town, with a huge variety of food choices. 1230-1330 Explore the town of Bellingen, enjoying the amazing range of shops and food stores, and maybe chat with the locals. 1330-1430 Cool off in crystal-clear swimming holes in the Glennifer Valley, known by locals as “The Promised Land” due to its amazing beauty. 1430-1500 Recline your bus-seat, and have a nap on the way home to your Coffs apartment. 0600-0800 Sunrise surf at the best spot in Woolgoolga (affectionately called “Woopi” by locals). 8000-0930 Breakfast at a select local café in Woopi. 0930-0945 Check the surf from Woolgoolga Headland lookout, maybe spot some whales on their seasonal migration or kangaroos having a morning feed. 0945-1200 Surfing at the best spot – or a surf lesson for beginners. 1200-1230 Lunch at Woopi – maybe enjoy some of the authentic, aromatic cuisine offered by the local Indian community. 1230-1300 Check out the local specialty shops in Woopi. 1300-1430 Rainforest walk to Woolgoolga Creek Waterfall Lookout in Sherwood Nature Reserve, cooling off in the freshwater swimming holes. 1430-1500 Drive back to Coffs Harbour in the airconditioned bus. 1500 Time to relax back at your apartment after a big day. A home-delivery meal is looking really good for dinner tonight! 0600-0800 Sunrise surf in Coffs. 0930-1100 Into the bus for a trip up the Great Escarpment, along the beautiful Waterfall Way to Dorrigo Plateau, stopping at Bellingen for some morning tea on the way. 1100-1200 Arrive at the Dorrigo Rainforest Centre, and stand above the tree-tops on the Skywalk boardwalk. Learn about the local history and wildlife of Dorrigo National Park, which is part of the Gondwana World Heritage Rainforest. 1200-1230 Enjoy lunch at the Canopy Café overlooking the tree-tops. 1230-1400 Explore the rainforest on foot on the many designated walks, and also from your tour bus, where you’ll see magnificent waterfalls, ancient, giant rainforest trees and spectacular scenery. 1400-1500 Back home down the mountain, stopping at breath-taking lookouts and waterfalls along the way. Make sure to bring your camera! 0600-0800 Sunrise surf in Coffs – no long bus-trips today! 0800-0930 Breakfast at a select café near your apartment. 0930-1200 Surfing at the best spot – or a surf lesson for beginners – you’re getting good at it now! 1200-1300 Zorb soccer – a massive laugh for you and your friends, as you bounce off each other, trying to kick a goal! 1300-1345 Lunch is an Aussie barbeque at Diggers Beach park. 1345-1500 Enjoy Kayaking and Stand-up Paddleboarding on Coffs Creek – a wonderful way to see the Botanic Gardens, and relax and unwind in nature. Maybe catch an afternoon show at Dolphin Marine Magic, the local marine park. 1500 Back to your apartment for your last night on the Coffs Coast…. 0600-0800 Last sunrise surf for this Tour. 0800-0930 Last breakfast – you choose your favourite café. 0930-1200 Choice of surfing, or surf lesson, or an add-on activity that you’d arranged earlier, or any other free activity that you and your group would like to undertake before the Tour comes to an end. 1200 Off to the airport with plenty of time to catch your flight, and fond farewells all round. The Coffs Coast’s mild, sub-tropical climate is arguably the best in Australia, so you’ll enjoy outdoor activities all year round. Average air temperatures range from 19-27°C (66-81°F) in summer and 7-19°C (45-66°F) in winter. Water temperatures average 25°C (78°F) in summer and 21°C (71°F) in winter. The Coffs Coast has a diversity of landscapes, with mountain escarpments, World Heritage rainforests, green hinterlands and 90km of coastline blessed with dozens of golden sandy surfing beaches. The Solitary Islands Marine Park extends from the coast, and is an underwater wonderland. There are literally hundreds of outdoor activities and sights to enjoy, to suit all ages, interests and budgets. Your tour guide will tailor design an itinerary just for you and your group to ensure you make the most of your stay. Coffs Harbour airport has daily flights to and from Sydney, Brisbane and Melbourne. Flights are offered by several airlines, are quick, economical and the fastest way to reach the region. If you’d like to sight-see along the way, trains and buses offer daily services along the NSW east coast that stop at Coffs Harbour. We are located a couple of hours south of Byron Bay by bus. Once you’ve arranged your mode of transport, your Tour Guide will collect you from the airport, train station or bus-stop, and settle you in to your apartment, then drop you off at the end of the tour. Just advise us of your arrangements and we will make sure you’re there on time! 7 days/6 nights – 2 500 AUD per adult/ 1 250 AUD per kid. 4 days/3 nights – 1500 AUD per person/ 750 AUD per kid. "I attended Surf Tours as part of a college leadership retreat, and was extremely impressed with the service from the staff. All the staff and organisers were so friendly, helpful and kind providing around 20 people fresh fruit, water and giving us some great tips. We were also allowed some free time to explore the beaches and water." "Arrived in Coffs with a view to spending a day, but not sure what to do. Found this experience. Well worth the money, there was no, everything done at a relaxed pace. Got to see the sights and have some fun would highly recommend this to anyone. Instruction was great even managed to stand on a surf board." "Learning to surf and try stand up paddle boarding have been on my bucket list for years and finally at 53 I got to tick these activities off and try out a few other things. What a day, simply fantastic. I took my daughter and a few friends on a tour to celebrate the end of Year. We all loved it so much. The Zorb ball is a must! Thanks guys for the best day ever, we were so worn out at the end of the day we all collapsed by 7pm. A first for the teenagers. We will definitely book again. It was worth every cent." "What a fantastic way to learn how to surf!! Thanks so much. Incredible locations, wonderful people and such a great range of interesting things to see and do...I highly recommend this awesome holiday!!"